Steve McClaren is to replace Brian Kidd on England's coaching staff for the duration of Euro 2004. Kidd has undergone surgery after being diagnosed with prostate cancer and Middlesbrough boss McClaren will act as his temporary replacement. 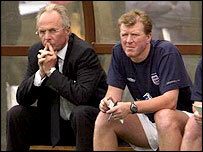 McClaren was part of England coach Sven-Goran Eriksson's backroom set-up at the World Cup in 2002. But he quit the role to concentrate all his efforts on managing Boro, who he led to Carling Cup success this season. Eriksson, who names his initial 23-man squad on Monday, told the FA's website: "I am very sorry that Brian will not be part of the coaching team this summer, but I fully respect his decision and his professionalism. "Brian has played a key role in qualifying for Euro 2004 and in the ongoing development of the team. "He is a top-quality coach who is admired by everyone he works with. "It is very good for England that we can bring in someone of Steve's calibre at this late stage. "I know Steve very well and respect his abilities as a top-class coach, and am looking forward to working with him again." Kidd, who joined the England set-up in February 2003, said: "Physically I don't believe I could fully contribute to the level of coaching that will be required at the European Championship. "Therefore I have spoken to Sven several times and have decided that it is in the interests of everyone involved with England team that I do not travel to Portugal. "Working with England is an enormous pleasure and privilege, but it would not be fair on Sven or the players if I were to be at less than 100%. "Of course I will be watching all the games and wishing England all the best." Hull boss Peter Taylor had offered his services to the national side in Kidd's absence, but the FA has opted to re-unite McClaren with Eriksson. McClaren has been given clearance by Middlesbrough to resume his England duties on a temporary basis. Good decision...come on you England! The Boro boss said: "I am greatly looking forward to joining up with England again, although obviously I'm sorry that Brian has had to withdraw. "It is tremendous honour to be involved with the national team, and I have always enjoyed my relationship with Sven and the rest of the coaches and players. "Euro 2004 is a huge tournament and I know from my experience at the World Cup just how exciting it will be."